Welcome Guest,Sign in or register. Interviewing, OR forms & General Info. Join our mailing list and receive event updates and valuable information. We never sell, share or rent your personal information to any third parties under any circumstances. We may share information with governmental agencies or other companies assisting us in fraud prevention or investigation. We may do so when: (1) permitted or required by law; or, (2) trying to protect against or prevent actual or potential fraud or unauthorized transactions; or, (3) investigating fraud which has already taken place. The information is not provided to these organizations for marketing purposes. Humorous, jubilant and touching by turns, this story of the relationship between man and dog is informed by the author's grasp of animal research and his attachment to Merle, a stray dog he adopted. 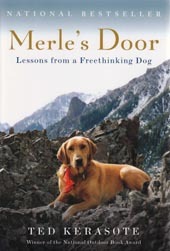 A Labrador mix, Merle first appeared while the author was on a camping trip. Kerasote (Out There: In the Wild in a Wired Age), an award-winning nature writer, decided to take his canine friend home to rural Wyoming. This chronicle of their 13 years together is interspersed with studies by animal behaviorists that strengthened Kerasote's desire to see Merle as a responsible individual rather than a submissive pet. Merle set his own eating schedule (though not without early mishap), refused to hunt birds (although not elks) and, according to the author, possessed a range of emotions and sentiments similar to those of humans.